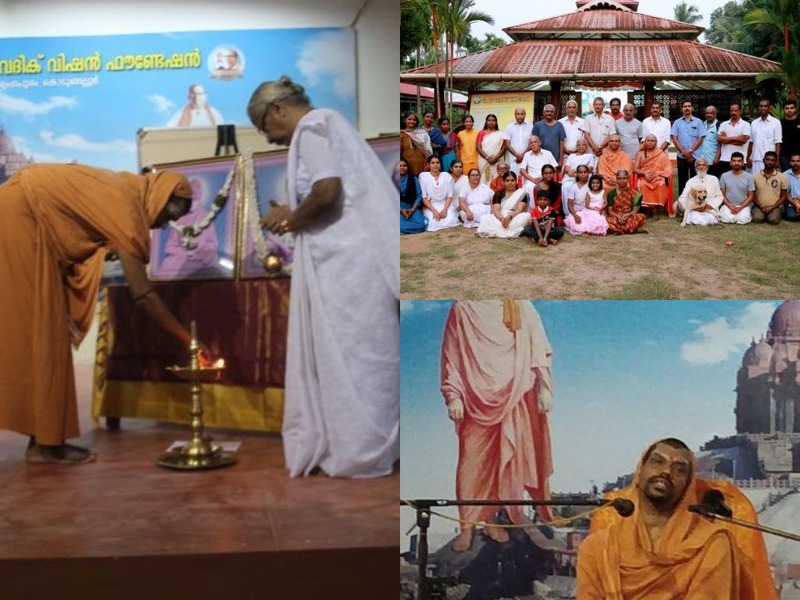 17th December to 21st December, the people of Kodungallur were blessed by the Holy presence of Srimad Swami Haribrahmendranandaji, who was to be the chief resource person for the Spiritual retreat at Anandadham. On 17th December in the evening at 8 p.m.Sreemad Swami Haribrahmendrananda Tirtha from Somashram, Uttarkashi, arrived at Anandadham. He was received with Purna Kumbha.He got introduced to the students and devotees who were eagerly waiting to have a glance of him. Classes started from 18th, after the formal inauguration, at 6.15 a.m. Usual Kendra routine was followed, with pratahsmaran followed by yogabhyas, before the classes started everyday at 6.30 a.m. First session in the morning was taken by Swamiji on Patanjali Yoga sutras.This was followed by second session on Karma Yoga according to Swami Vivekananda conducted by Mananeeya Lakshmi Didi.Third session was again by Swamiji followed by Cyclic Meditation conducted by Sri Sudhakarji. After this bhajanSandhya and supper followed. 44 participants were blessed with the experience of this Satsang.